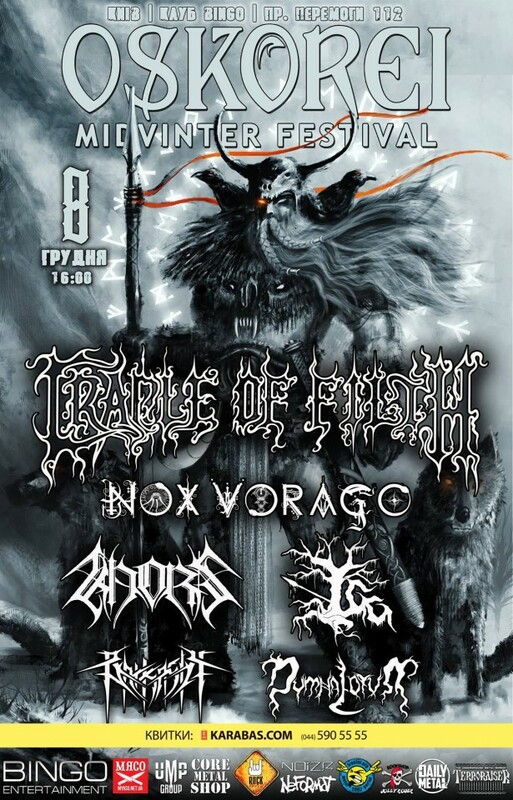 Oskorei festival, featuring Cradle of Filth (UK), Nox Vorago (SE), Khors (UA), YGG (UA), Barkasth (UA), and Dymna Lotva (BY), will be held on December 8, 2018, in Kyiv, Ukraine. See also photo report from Kyiv’s Oskorei – Midvinter festival 2017. "The well-known to fans of extreme metal, the annual Oskorei festival calls again under its banner on December 8 at Bingo Club in Kyiv. Founded in 2011, the Oskorei festival specializes in the multi-faceted culture of atmospheric metal, drawing inspiration from the depths of medieval myths, ancient heritage, historical experience, and mystical mysteries of the mother nature. This year’s festival goes to a qualitatively new level, because its headliner will be the English legends Cradle of Filth, the band that gave the world a subgenre, which will later be called symphonic black metal. In addition to the cult English act, the festival will also feature: the well-known Ukrainian group Khors, which will perform an exclusive program, the first performance will be marked by the cult YGG studio project, the rising star of the Kharkiv black metal school Barkasth, the Swedish occultists Nox Vorago, and the Belarusian depressive metallers Dymna Lotva."